Why would anyone collect insulators, anyway??? Some love the associated history and "romance" of the era (railroads, telegraph, telephone, electricity). Some got started because they were bottle collectors first, then they branched out. Some folks like "old stuff," and insulators certainly qualify. The first were made around 1844. Some just like the "purty glass" and how it looks in a window with the light shining through it. Each person has their own reasons, many more than I could list here. As I investigated the hobby of insulator collecting, it seemed like a really good fit for me. Its genetic-----Pappy (my grandfather, Charles J. Walton, Sr.) worked for Southern California Edison. He was an occasional collector of insulators he found while working. Its more genetic-----I had other relatives (Ruth family) who were glass workers in the Corning, NY area. 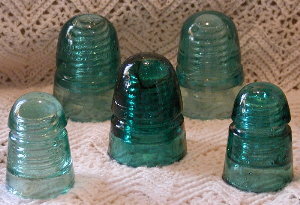 The Corning Glass Factory made insulators. Its recreational-----I love mucking about outdoors. Guess I've always been a bit of a tomboy. Hunts sounded like fun. Its visual-----Okay, I admit it. I like "purty" glass and old stuff. Its historical-----I am a fan of the Victorian age. 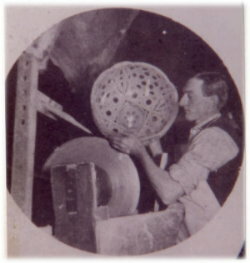 Insulator manufacture was at its heyday during the Industrial Revolution associated with that era. 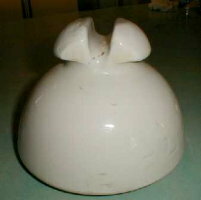 Its locational-----There is a style of porcelain insulator (U-746) that gets its nickname from my hometown--Redlands, California. That was the clincher. How could I resist? also known as the "Redlands" insulator. It was designed in the 1890s for use on a line that ran 8 miles from the Mill Creek Station to Redlands, California. This is the U-935, made by Imperial. 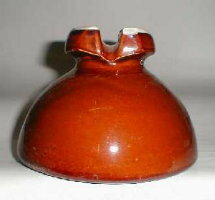 The Redlands insulator was developed by modifying this design. To learn more about the history of the Mill Creek to Redlands line, click here. on a large punch bowl at the Corning Glass Factory. You may discover you want to collect some for yourself!